Jewish pride is on the rise. Ever since the six day war in 1967, Jews have been coming out of the closet and showing the world that they are proud of who they are. New religious communities have sprung up all over North America and Europe. Jews flock to visit Israel and even when they are in their home countries, they show support for the Jewish State in many different ways. Interest in Judaica is growing and you can see it by visiting any Judaica website on the net. Ritual objects like mezuzas and tefilin are on offer as well as Kiddush cups, candlesticks, Jewish books and cds, and Jewish art. Jewish jewelry is one of the biggest sellers. Growing up Jewish in a suburb of New York City where we were the minority, I was well aware of the differences between us and the other kids. Many of my gentile classmates wore crosses around their necks. Some of the Jewish girls wore the Star of David and the guys wore a small silver mezuzah. I think it was more about identity than believing in a creed. What makes jewelry Jewish is the symbol used. The most common ones are the Star of David, the Chai symbol and the Hamsa or Hand of Miriam. The latter is not exclusively Jewish. It was adopted by the Jews from the Arab countries of North Africa who use it as a talisman against the evil eye. Other expressions of Jewish Jewelry are verses from the Torah engraved on the piece. A common one is "Ani ledodi veledodi li" which means " I am to by beloved and my beloved is to me". This verse from the Song of Songs is often engraved on wedding rings or necklaces. Another popular verse is "Shema Yisrael…" the primary statement of a Jew's faith in G-d. When I became religious one of my keen interests was the study of kabala. I had studied some of the esoteric teachings of the religions of the Far East like Buddhism and Hinduism so I was anxious to know what the Jewish take on mysticism was. I learned about creation via the ten sephirot, the relationship between man and G-d using the metaphor of light and vessel, and many other things. In the last 20 years, kabala inspired jewelry has become quite popular. 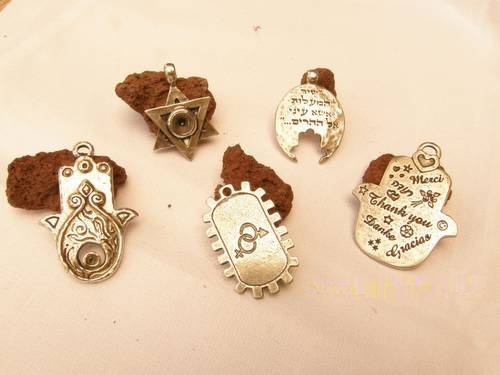 Silver wheel pendants with the 72 names of G-d inscribed on it is one example; the symbol of the Tree of Life with the diagram of the 10 sephirot is another one. The stones from the breastplate of the High Priest are also used in jewelry to attract blessings to the wearer. This is one of the added benefits of wearing Kabala jewelry. It is believed to be an amulet that brings blessing or protects from harm. One of the items popular in recent times is the red thread. When you walk down the stairs leading to the Western Wall Plaza in Jerusalem, you are sure to pass at least one beggar giving out the red thread to passersby in return for a donation. This cotton thread is wound around the grave stone of the Matriarch Rachel who is buried on the edge of Bethlehem. It is commonly worn on the wrist or around the neck in place of a chain and believed to bring good fortune. I think Jewish jewelry is popular because it fills a need – a need to identify and to express solidarity with the Jewish Nation; a need to connect to Jewish tradition whether it is mainstream or esoteric. Jewish jewelry takes a person from the general to the specific; from being a member of humanity to being a Member of the Tribe. Meaning and belonging are two very powerful motivators for people and Jews are no different. Jewish jewelry is so to speak a link in the chain of tradition and continuity of the nation that has lived scattered around the world for two thousand years. Now that Jews have come back to Israel that chain is strengthened a hundred fold. That is what makes Jewish jewelry special.